The most complete routine to bring out your natural glamour. You know you want them, you know you need them. All Hellobody face products are now included in a unique bundle, for a very limited time. Your skin care routine could not be more complete: from cleanser to moisturizer, The Glam Set will take care of all your skin’s need. This is your personal SPA treatment that you can do from the comfort of home, anytime you wish. Glam yourself up, you deserve it! The coffee shot your skin will love! No-mess. No-fuss. Simply a perfect application with our mask brush! Be ready to kiss with our lip-smoothing sugar scrub! The ultimate lip-service at home or on the go! Clean your face with the Coco Fresh Face Cleansing Foam (daily). Peel superfluous skin cells with our Coco Pure Coffee Face Scrub (two to three times a week). It contains kaolin (white clay) which brings together the toxins in your skin cells, transports them outwards and stimulates the blood flow. 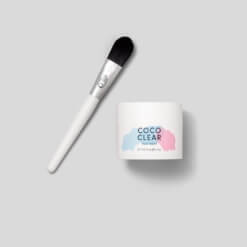 Apply the Coco Clear Mud Mask with its own Mask Brush (two to three times a week) and let it rest for 20 minutes. Its Heimloor Clay can slightly tingle and heat your face. The warmth expands the skin vessels and improves blood flow. The body’s own defenses are increased and self-healing is stimulated. 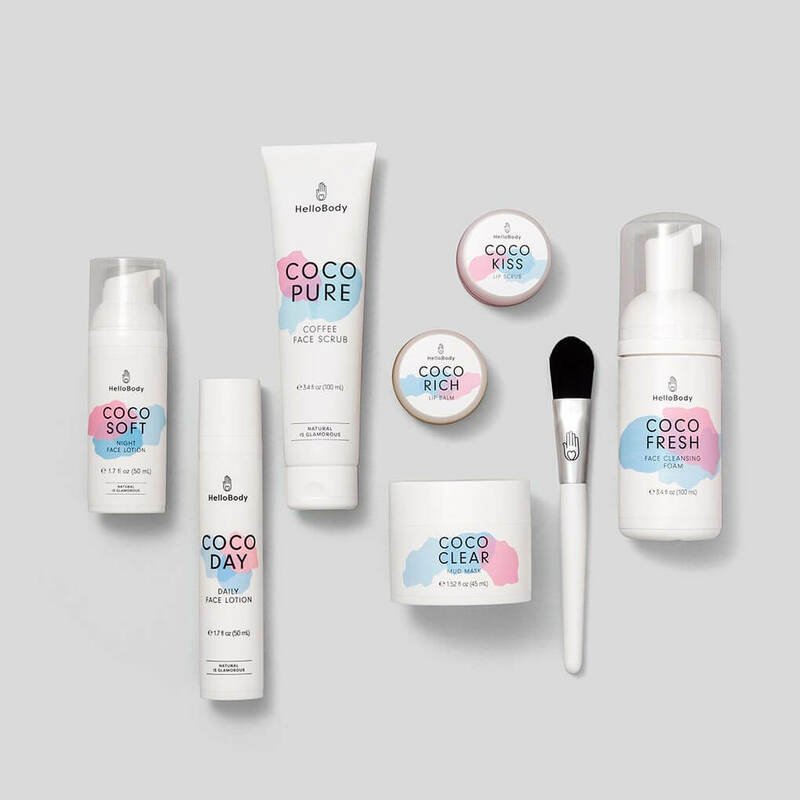 If your skin is very sensitive, alternate between the Coco Pure and Coco Clear and use only one at a time. 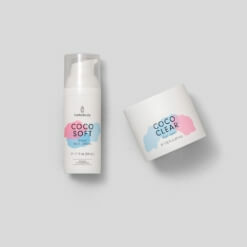 Apply a small amount of Coco Soft Face Lotion to your face and décolleté at night, or do the same in the morning with the Coco Day Face Lotion. For a more sofisticated routine, don’t forget your lips! 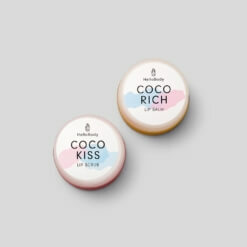 Use the Coco Kiss scrub to gently exfoliate and brush away dry skin, then apply Coco Rich balm freely, as needed. Water, Glycerin, Caprylic/Capric Triglyceride, Cetearyl Alcohol, Distarch Phosphate, Polyglyceryl-3 Dicitrate/Stearate, Avocado (Persea Gratissima) Oil, Shea (Butyrospermum Parkii) Butter, Jojoba (Simmondsia Chinensis) Oil, Sorbitol, Candelilla Wax, Moor (Peat) Extract, Potassium Sorbate, Natural Fragrance, Sodium Benzoate, Niacinamide, Tocopheryl Acetate, Xanthan Gum, Citric Acid, Dog Rose (Rosa Canina) Seed Oil*, Sodium Carbonate, Cocoyl Proline, Coco Glucoside, Panthenol. Water, Glycerin, Kaolin, Robusta Coffee (Coffea Robusta) Seed Powder, Cetearyl Alcohol, Caprylic/Capric Triglyceride, Walnut (Juglans Regia) Shell Powder, Polyglyceryl-3 Dicitrate/Stearate, Avocado (Persea Gratissima) Oil, Shea (Butyrospermum Parkii) Butter, Coconut (Cocos Nucifera) Oil, Hydrogenated Castor Oil, Sweet Almond (Prunus Amygdalus Dulcus) Oil, Potassium Sorbate, Sodium Benzoate, Xanthan Gum, Natural Fragrance, Tocopheryl Acetate, Levulinic Acid, Dog Rose (Rosa Canina) Seed Oil*, Lactic Acid, Sodium Levulinate, Peat (Moor) Extract, Sodium Carbonate, Cocoyl Proline, Soybean (Glycine Soja) Oil, Coco Glucoside, Panthenol, Tocopherol. Sugar, Coco-Caprylate/Caprate, Silica Dimethyl Silylate, Beeswax (Cera Alba), Shea (Butyrospermum Parkii) Butter, Caprylic/Capric Triglyceride, Tocopheryl Acetate, Natural Fragrance, Carmine (CI 75470). Lanolin, Olive (Olea Europea) Fruit Oil, Coco-Caprylate/Caprate, Coconut (Cocos Nucifera) Oil, Beeswax (Cera Alba), Shea (Butyrospermum Parkii) Butter, Tricaprylin, Natural Fragrance, Tocopheryl Acetate.